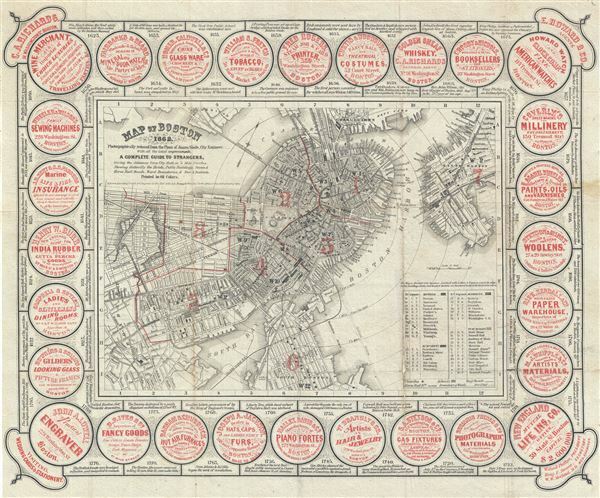 This is a charming 1862 map or plan of the city of Boston, Massachusetts, by the famous Boston lithographer Louis Prang. Covering the entire city of Boston, Prang's meticulously detailed map illustrates streets, piers, parks, bridges, buildings, railways, wards, as well as radial distances from City Hall. An index of hotels, markets, public buildings and railroad depots is included in the lower right quadrant. Perhaps the most unusual and charming feature of this map is its border, which includes 28 beautifully engraved trade advertisements, and important events in the history of Boston dating from 1623 to 1860. These include advertisements for wine merchants, engravers, fancy goods, furs, booksellers, glass ware, etc. Some of the important events listed along the timeline include 'The first free Public School was established here, 1635,' 'The first person executed for witchcraft was Widow A. Hibbins, 1656,' '1722, Only 3 trees were on the Common, the big Elm and 2 in front of Parks St. Church,' 'A great earthquake, the only one of note, destroyed 1500 houses in Boston, 1755,' 'The Tea was destroyed by a party disguised as Indians at E. Pool Wf., 1773,' 'The first two railroads, the Providence and the Wochester were opened this year, 1835,' etc. Louis Prang (March 12, 1824 - September 14, 1909) was a Boston based publisher of lithographs and chromolithographs active in the latter half of the 19th century. Prang where born in Germany where he studied printmaking and engraving from his father, a noted master of the calico process. Around 1850 Prang immigrated to the United States fearing political persecution in Germany. In the United States, Prang partnered with another German Printmaker, Julius Mayer, establishing the short-lived Prang & Mayer firm. Ten years later, in 1860, Prang started his own chromolithography firm, L. Prang & Co. Prang quickly established himself as a publisher of post cards and other small prints, which were popular as gifts and collectibles. Many consider him to be the "Father of the American Christmas Card". Prang also issued larger format chromolithographs of popular art and even printed his own magazine to the effect Prang's Chromo: A Journal of Popular Art. Through his magazines and limited edition printings, Prang was influential in establishing the popularity of the chromolithographic process in America. Very good. Some damage and toning along original fold lines. Minor spotting. Professionally flattened and backed with archival tissue.